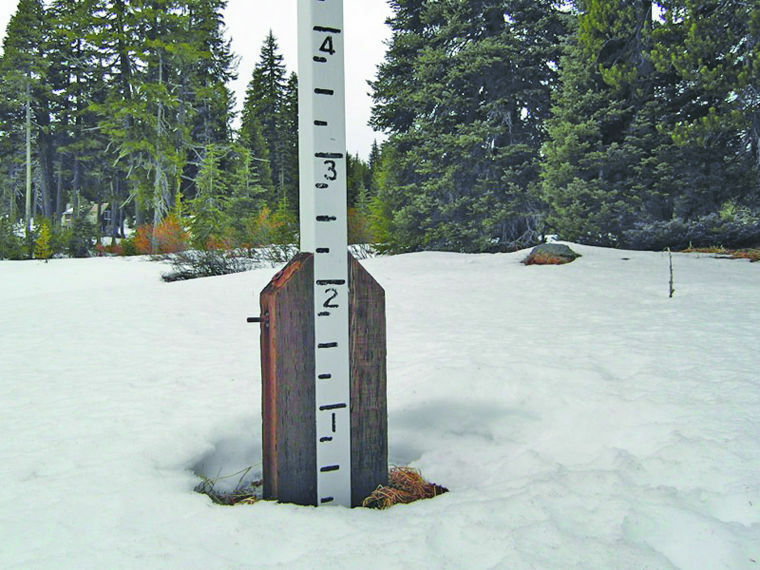 In this article we’ll look at climate variability and trends through the lens of long term snowfall at Crater Lake National Park, as well as precipitation and drought patterns in Medford, Oregon. 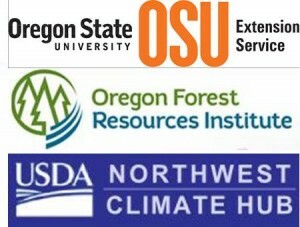 As a forester working in southern Oregon, I’m very interested in rainfall, drought and snowpack, which influence things like fire danger, forest health, and stream flows. Crater Lake snowpack varies from year to year, but is it declining over time? Left photo: Crater Lake snowpack in July circa 1915. Photo credit: TheOldMotor.com. Right photo: Crater Lake snowpack in January 2015. Photo credit: Klamath Falls Herald Tribune. 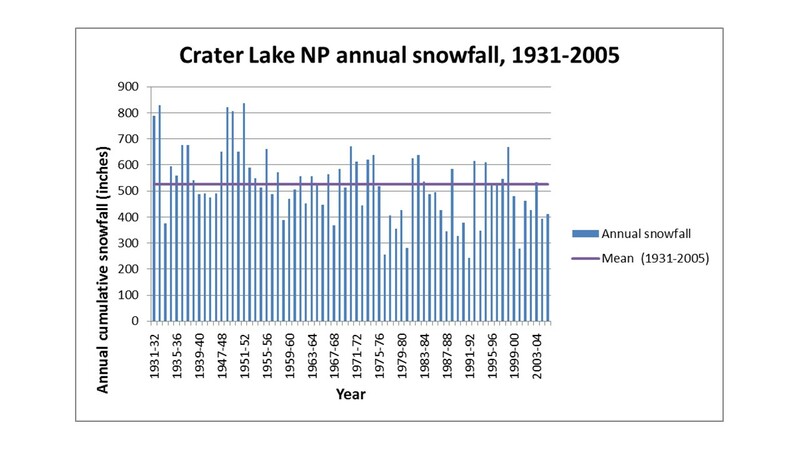 The chart below shows annual snowfall at Crater Lake National Park over a 74 year period from 1931-2005. The mean annual snowfall over this time period was 526 inches (44 feet! ), but you can see that yearly snowfall amounts varied quite a bit around this average value. And that, in a nutshell, is climate variability: fluctuations around a long term average value. Note: There were no snowfall data collected during World War II from 1942-42 to 1945-46. While climate averages are interesting, the range of values is just as important. 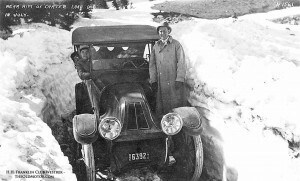 For example, the highest snowfall accumulation during the 1931-2005 period was 835.5 inches (just shy of 70 feet) in the winter of 1951-52, while the lowest value was the measly 243 inches (20 feet) that fell during the 1991-92 winter season. A winter with heavy snowfall means more streamflow while a light year often means higher fire danger and low flows, which is generally a negative for fish, irrigation, and recreation. 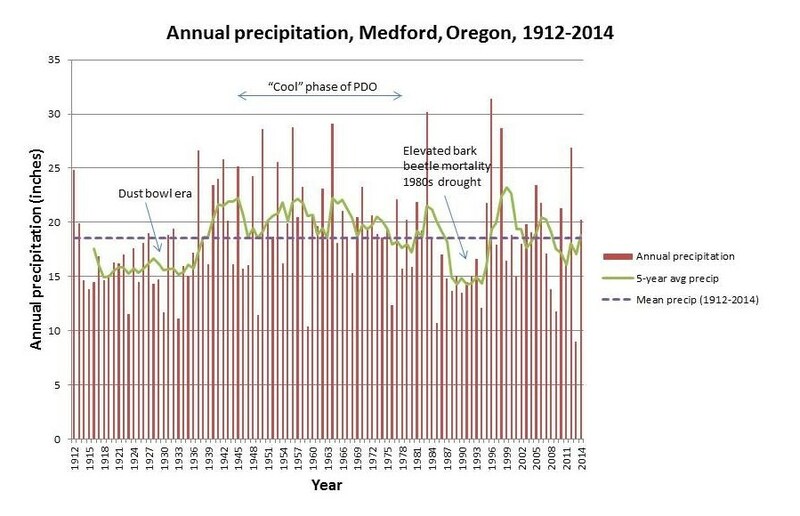 Here’s a look at annual precipitation in Medford, Oregon over the last 102 years. As with Crater Lake snowfall, there’s quite a bit of year-to-year variability around the annual average of about 19 inches. To make it easier to spot short term trends, we can compute a 5-year running average. This is simply the average of the current year’s and previous four years’ values. Looking at the 5-yr average it’s apparent that there was a long-term drought from the teens until WWII, a period from the early 1940s through the late 1970s when rainfall was mostly above average, and another drought in the 1980s. As a side note, bark beetle mortality in SW Oregon really jumped up in the late 80’s with the drought. These short-term (a few years to a few decades) trends are related to large scale climate patterns such as the Pacific Decadal Oscillation (PDO). The PDO was in the “cool phase” from about 1945 to 1977. This was a period of generally higher precipitation, including snowfall, in the Pacific NW. We see a lot of variability from year to year, and longer term variation associated with cycles like the PDO. As a result, it can be hard to discern long term climate trends. 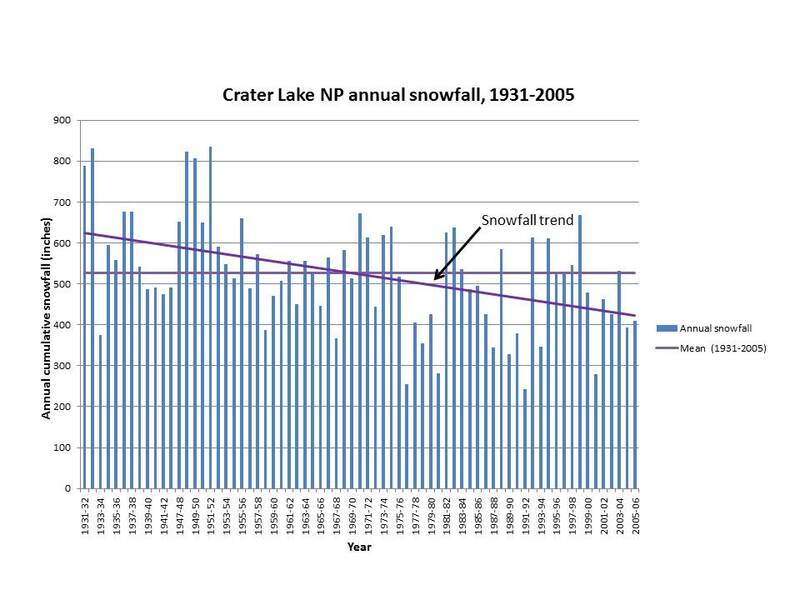 Let’s look again at the Crater Lake snowfall data – given all of the year to year variability, has there been a long term change in average annual snowfall? The purple line shows a downward trend in snowfall accumulation, which is statistically significant. 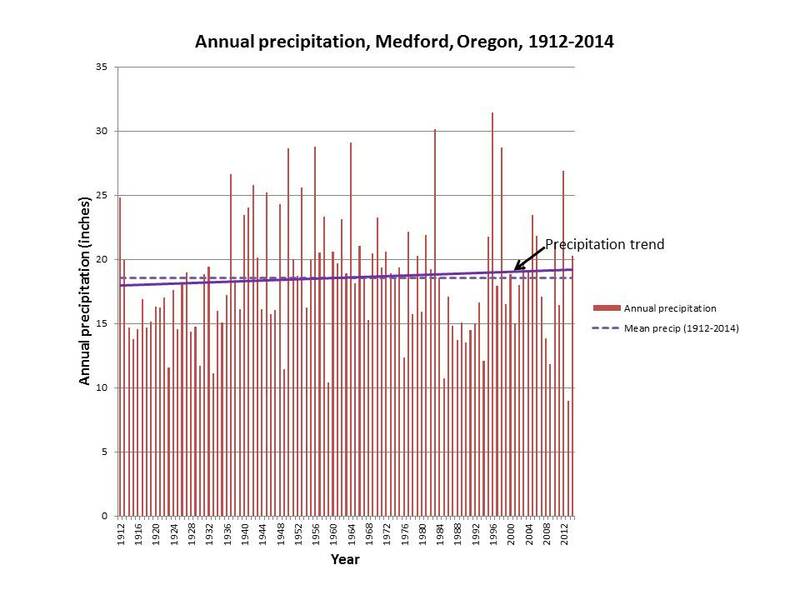 By contrast, there has been a slight upward trend in Medford’s rainfall over the past century, but it’s not statistically significant. So we can say with some confidence that over the past 80 years there has been a downward trend in average snowfall at Crater Lake, and no real change in precipitation in Medford. This is consistent with PNW climate records that are showing climate change in the form of long term increases in temperature, reduced snowfall, and no significant changes in average annual precipitation. Climate variability is the fluctuation around a long term average value. Both the average and the range of values, the extremes, are of interest. Our local climate is highly variable, with substantial year to year fluctuations, as well as longer term variations associated with cycles like the PDO. Climate change is long term change, that is, an increase or decrease in the average value over many decades. Future articles in this series will talk about how to manage with climate variability in mind. And they’ll also address another aspect of climate change not discussed here: changes in the range of values, i.e., the extremes.